I thought it might be helpful if I wrote a quick note about my previous work on Debian packaging and Kolab. As my blog can attest, I have written a few articles about packaging and the effort required to make Kolab somewhat more amenable to a convenient and properly functioning installation on Debian systems. Unfortunately, perhaps due to a degree of overambition and perhaps due to me being unable to deliver a convincing and/or palatable set of modifications to achieve these goals, no progress was made over the year or so I spent looking at the situation. I personally do not feel that there was enough of a productive dialogue about aligning these goals with those of the core developers of Kolab, and despite a certain level of interest from others, I no longer have the motivation to keep working on this problem. Occasionally, I receive mails from people who have read about my experiments with Debian packaging or certain elements of Kolab configuration that became part of the packaging work. This message is intended to communicate that I am no longer working on such things. Getting Kolab to work with other mail transport/delivery/storage systems or other directory systems is not particularly difficult for those with enough experience (and I am a good example of someone who has been able to gain that experience relatively quickly), but integrating this into setup-kolab in an acceptable fashion ultimately proved to be an unrealisable goal. Other people will presumably continue their work packaging various Kolab libraries for Debian, and some of these lower-level packages may even arrive in the stable release of Debian fairly soon, perhaps even delivering a recent version of those libraries. I do not, however, see any progress on getting other packages into Debian proper. I continue to have the opinion that this unfortunate situation will limit wider adoption of the Kolab technologies and does nobody but the proprietary competition any good. Since I do not believe in writing software that will never be used – having had that experience in a professional setting where I at least had the consolation of getting paid for such disappointing outcomes (and for the waste of my time) – my current focus is on developing a low-impact form of standards-based calendaring for existing mail systems, without imposing extensive infrastructure requirements when adopting such a solution, and I hope to have something useful to show in the fairly near future. This time last year, I was much more upbeat about the prospect of getting Kolab into Debian and into more people’s hands. Now, I only wish that I had changed course earlier and started on my current endeavour considerably sooner. But as people like to say: better late than never. I look forward to sharing my non-Kolab groupware developments in the coming months. In my last post about Kolab I hinted about unbundling the LDAP server and using a remote server for LDAP service. Since then, I’ve been looking at making the IMAP server an “unbundled” component – IMAP service still being required, of course – and even at supporting Dovecot in setup-kolab as well. After all, choice is an important motivation for adopting Free Software, and we should at least try and make that choice convenient to exercise where possible. Supporting a choice of IMAP servers gives everyone a bit more flexibility and should make Kolab a bit easier to adopt. The Dovecot work is still very much in progress, however. If you want to install the complete stack, the kolab metapackage will bring everything you need into the installation and hopefully provide you with a self-contained solution. 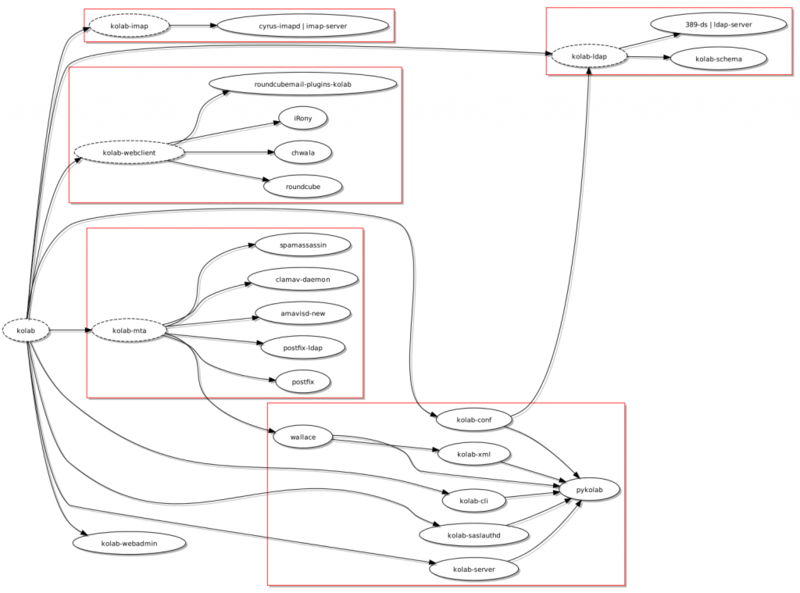 But now, the kolab metapackage is formulated in terms of the “infrastructure” components plus kolab-minimal. And if you want to install something that gets its services from other computers, kolab-minimal should be all you need. Obviously, this work deviates from the “official” Kolab packages, but since it appears that those packages aren’t being refreshed with upstream fixes as often as might be desirable, I’ve decided to put some source packages online. If you should be tempted to build them and try them out, please remember to do so in a test environment and that you do so at your own peril! And if you want to track my packaging changes, I’ve put a collection of repositories online, too. 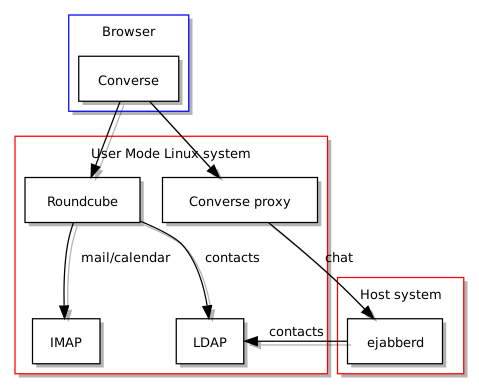 Note that the XMPP dependencies (Converse and ejabberd) are integrated into the above, but more testing is really needed to make sure that they become robust additions. Indeed, as part of the Converse plugin package there’s a patch that fixes an annoying bug that makes deploying the plugin almost like an “all or nothing” affair. So I’ve put them under a new metapackage – kolab-extra – for now. And the way the packaging invokes the configuration program – setup-kolab – probably needs some review, particularly the way setup-kolab wants to edit or replace configuration files of other packages. Some insights into the proper Debian way of doing this would be very useful indeed. I can imagine Kolab using configuration files in slightly different locations and changing references to where the configuration lives in only one key place (or a few key places), leaving the originals intact, but I haven’t been able to look at this in depth. And with that, I’ll give my modestly equipped desktop computer a rest from running two User Mode Linux instances and pdebuild in 1GB RAM (of the semiconductor variety, plus some swap). But I then discovered that ejabberd did not seem to work with the User Mode Linux environment in which I test my packages. This then gave me an excuse to contemplate the relationship between the different components. LDAP is central to the way Kolab manages credentials and is employed by ejabberd to authenticate users, but the LDAP service does not need to be located on the same server. Indeed, it is likely that in a larger organisation the services would reside on a number of different computers. 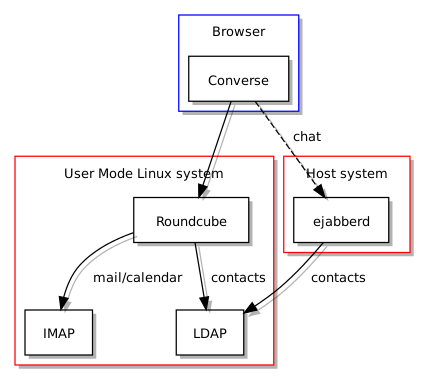 Since I was interested in writing a component to configure ejabberd for integration with the other Kolab components, but that this service would have to be installed outside my own User Mode Linux environment (within which Roundcube happens to reside), I therefore needed to find a way of teaching setup-kolab (Kolab’s setup script) about remote LDAP services as an alternative to any such service running on the same machine. And from this perspective I realised that the dependency on LDAP is a “soft” one: it is entirely possible to want to install Kolab without also installing an LDAP server suite, but the need for LDAP service remains. It thus falls on other computers to provide LDAP services to the computer running the chat service (and to the other Kolab services, too). A bit of adjustment to the setup_ldap module in pykolab and it became possible to choose a local directory or a remote one accessible via LDAP. At this point, running ejabberd outside User Mode Linux (UML) and connecting to the LDAP service running inside UML looked feasible, and I developed a setup-kolab component to propagate Kolab settings to ejabberd’s configuration file, but my desktop environment’s chat program didn’t seem interested in joining the testing effort. That meant that I really had to get the Converse plugin working within Roundcube, thus enabling chat within the webmail environment. There seems to be plenty of integration work still to be done. 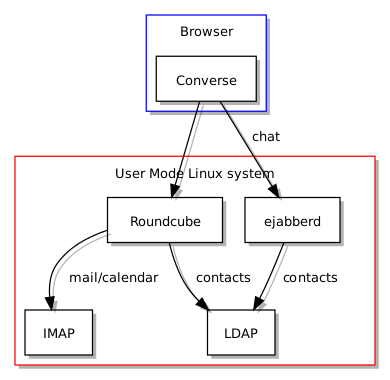 Although Converse can obtain contact details supplied by ejabberd from the LDAP service and thus provide immediate access to other users in the same organisation, the level of integration with the rest of the interface is still fairly loose: you cannot find a chat button in the address book for each contact, for example. Even so, the level of convenience probably already matches various other groupware solutions. I can’t wait to see what kind of communication or collaboration technology will be next, even if there will be a degree of work to make it a bit easier to set up with Kolab. And that reminds me to get the configuration nuts and bolts packed off and sent upstream so that everybody else can try it out. My recent diversion via pykolab may appear to have rather little to do with the matter of improving the Debian packaging situation for Kolab, but after initial tidying exercises with the pykolab code, I started to consider how the setup-kolab program should behave in the context of Debian packaging operations: what it should do when a package is installed, if anything, and whether it can rely on anything having been configured in advance. Until now, setup-kolab has been regarded as a tool that is run once the Kolab software is mostly or completely present on a system, but this is a somewhat different approach to the way many service-providing Debian packages are set up. Take MySQL as an example. Upon installing the appropriate Debian package providing the MySQL server, the user is prompted to set up the administrative credentials for the server. After this brief interaction, MySQL should be available for general use without further configuration work, although it may be the case that some tuning might be beneficial. It seems to me that Kolab could be delivered with the same convenience in Debian. Until now, many of the individual Kolab meta-packages – those grouping together individual components as functional units providing mail transport (MTA), storage (IMAP) or directory (LDAP) functionality – have only indirectly relied on the presence of the kolab-conf package providing the setup-kolab program. Indeed, if the top-level kolab meta-package is installed, kolab-conf will be pulled in as a dependency and setup-kolab will be available, and as noted above, since setup-kolab has been the program that configures a complete system, this makes some sense. However, this causes the work of configuring Kolab to be put off until the very end and thus to pile up so that a user may have to undertake a lengthy question-and-answer process to get the software working, and this can lead to mistakes and a non-working installation. But setup-kolab is familiar with the notion of configuring individual components. Although the Kolab documentation has emphasised a “one shot” configuration of everything at once, setup-kolab can be asked to configure different individual things, such as the LDAP integration or the integration with Roundcube (the webmail software supported by Kolab). Thus, it becomes interesting to consider whether individual packages can be configured one by one using setup-kolab until they have all been configured, and whether this produces the same desired result of everything having been set up (and hopefully without the same intensity of questioning). Now, with kolab-conf available when, for example, kolab-imap is being installed, the post-installation script of kolab-imap will be able to invoke setup-kolab and to make sure that a usable configuration is available by the time the Debian packaging system is done with the installation activity. But one thing might be bothering the attentive reader: why is kolab-ldap not dependent on kolab-conf? In fact, the configuration process has to start somewhere, and since information related to the LDAP directory is rather central to further configuration, this initial configuration takes place when the kolab-conf package is itself installed. And since this initial configuration needs access to the LDAP system, the dependency relationship is “inverted” for this single case, and kolab-conf populates the basic configuration so that subsequent package configuration can take advantage of this initial work. Command line usage of setup-kolab involves some fairly straightforward console-style prompting and input, but during Debian packaging activities, it is widely regarded as a bad thing to have packaging scripts just ask for things from standard input and just write out messages to standard output or standard error: people may be using graphical package management tools that offer alternative facilities for user interaction, and it is possible that console-style operations go completely unnoticed by both the user and such tools. Thus, there is a need to make setup-kolab aware of the facility known as debconf (which is not to be confused with the DebConf series of conferences that may well appear in any searches made to try and discover documentation about the debconf system). It would appear that debconf is used primarily within shell scripts, as the packaging scripts most commonly use the shell command language, but a goal of this work is surely to avoid replicating the activities of setup-kolab in other programs: it is not particularly desirable to have to rewrite the component-specific parts of pykolab in shell command language just to be able to use debconf to talk to users. Fortunately, the debconf package provides a Python wrapper for the debconf system, and although the documentation and examples are not particularly substantial or enlightening, a bit of experimentation and some consultation of the debconf specification has led to a workable level of interaction between setup-kolab and debconf so that the latter can prompt the user and supply the user’s input to the former without too much complaint. As previously stated, the aim now is to try and get the pykolab changes upstream – regardless of the Debian-related modifications, pykolab has been enhanced in other ways – and to try and reach consensus about whether this way of structuring the Debian dependencies is sensible or not. A substantial number of iterations involving pykolab adjustments, packaging improvements, pbuilder sessions and eventual deployment of the new packages in a virtual machine seem to indicate that the approach is not completely impractical, but it is possible that there are better ways of doing some of this work. But certainly, my confidence in the Debian packaging situation for Kolab is significantly higher than it was before. I can now see a time when the matter of installing and configuring Kolab (at least for common deployment situations) will be seen as entirely uninteresting and a largely solved problem. Then, people will be able to concentrate on more interesting matters instead. After my previous efforts at building Kolab packages using more traditional Debian methods, my attention then turned to the nature of the software itself, particularly since the Debian Kolab packages (as currently available from the Kolab project’s own repository) do not configure the software so that it is immediately usable: that job is assigned to a program called setup-kolab, which is provided in the kolab-conf Debian package but really lives in the pykolab software distribution. Thus, my focus shifted to what pykolab is and does, and to any ways I might be able to improve or adjust that software. 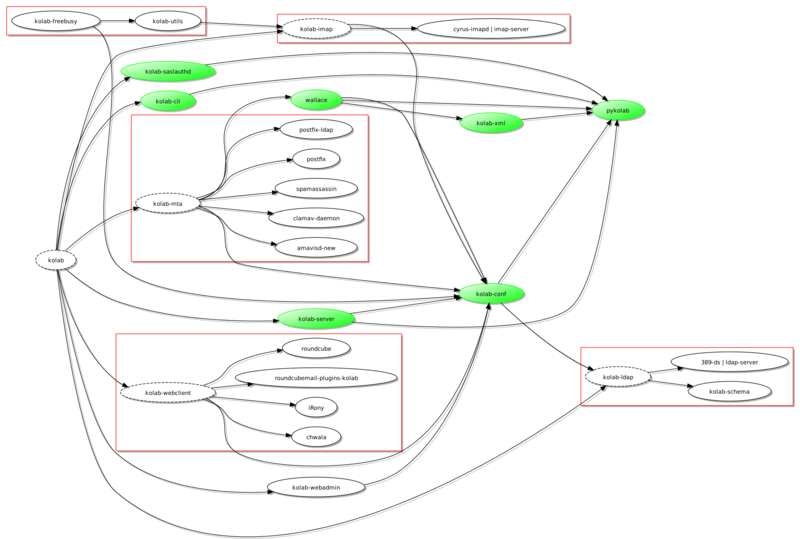 A quick examination of the Debian packages produced by the pykolab source package gives an indication of the different things pykolab provides: a command framework for configuration (kolab-conf), a command framework for administration (kolab-cli), and an underlying library that supports these and other packages (pykolab). It surprised me slightly that there was so much Python involved with Kolab – my perception had been that the project was mostly KDE-related C++ libraries combined with PHP Web applications (sitting on top of some fairly well-known and established programs and libraries) – and since my primary programming language has been Python for quite some time, I took the opportunity to go through the code and see if there were any trivial but worthwhile adjustments that could be made to make more substantial further improvements more convenient. Upon emerging from some verbose tidying efforts, hopefully being merged into the upstream code in the near future, I turned my attention to the way setup-kolab behaves. Although the tool mostly does the job already, there are things about it that are perhaps not quite as convenient as they could be. For example, until now, setup-kolab has made the user specify database credentials to access the MySQL database system (unless an explicit component other than MySQL or Roundcube has been indicated as an argument to the program), and in many cases this is not really necessary: the required database may already exist, and on a Debian system there are established ways to query the database system about existing databases without asking the user for the login details. Another desirable feature is that of being able to run setup-kolab and not have it try and perform configuration tasks that have already been done: although prior LDAP directory instances are detected and setup-kolab refuses to go any further unless a special option is given as a command argument, it would be nice if setup-kolab just mentioned that no work needs to be done, at least for most of the components. Ultimately, setup-kolab might itself be called from packaging scripts invoked during the installation of various different packages, perhaps bringing in the debconf framework to present a standardised interface on Debian systems, but hopefully not demanding the user’s attention at all. Until then, I hope that it can offer a convenient way of setting Kolab up and/or checking that the different components are ready to support Kolab in use. Upon inspecting the configuration of the kolab-freebusy package, I noticed that it had not been set up right, either in its default configuration or by setup-kolab. Some further investigation revealed that setup-kolab was trying to configure a file that the kolab-freebusy package had renamed, thus making configuration somewhat ineffective. Fortunately, although not without some duplicated work before I realised, this particular bug had already been fixed in a later version of the package. 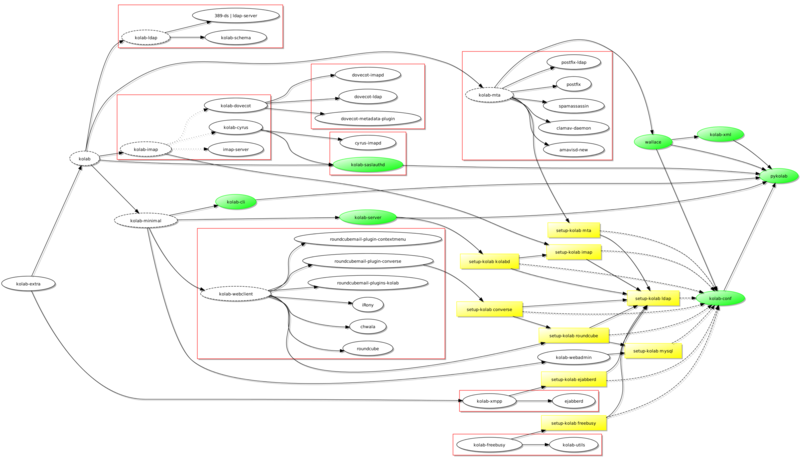 Still, one or two other things also needed changing and thus a trip via pbuilder was in order. So, since Kolab stores calendar information in IMAP but wants to be able to publish it in a relatively efficient way, the daemon runs periodically and exports free/busy resources for calendar users. Such information is then provided upon request when clients access the free/busy Web service provided by the kolab-freebusy package. Although one can install only the Web service (in the kolab-freebusy package) and ask for free/busy information, the exercise is rather pointless: there will be no information to retrieve, at least in the default configuration of the system and with the default functionality being offered; only after obtaining and running the daemon (in the kolab-utils package) will the Web service have any use. I am inclined to think that if someone wants to install and use kolab-freebusy, they should also have kolab-utils pulled in for their convenience (or perhaps a package that only provides the daemon). All in all, I think Kolab offers plenty of things to explore, review, and – on occasion – fix or improve, but it has to be mentioned that once the packages provided the right directories for logging and free/busy resource storage, and once the Web service started to use the correct configuration, everything seemed to work as intended. I hope that with some more polishing, we will see something that more people will be able to try out and perhaps feel comfortable using in their own organisation. Getting some of my changes upstream and into the packaging. On the latter front, the Kolab packaging effort in Debian itself is apparently being revived: this will be highly beneficial in a number of ways, not least that of using Debian-native packaging tools instead of the less-than-optimal Open Build Service. A revival of the Kolab Wiki. It is nice to be able to write things up somewhere, evolve a consensus about how things might be done, and collaboratively describe how things are already done: it is rather hard to do this on mailing lists or using reference documentation tools like Sphinx, and blogging about it only achieves so much. Actually improving the functionality and not just the nuts and bolts of getting Kolab installed and set up. Obviously, I aim to continue doing these things and not just ask for things and expect to see others doing them, and I am quite sure that there are others in the community who are similarly motivated. If your organisation could benefit from Kolab or does so already, or if it benefits from any Free Software groupware solution, please consider supporting the developers of those solutions in their work. Without actively developed Free Software groupware, there is a risk that, over time, other Free Software deployed in the average organisation may be under threat as proprietary software vendors and uninformed decision-makers use excuse after excuse to flush out diversity and replace it with their own favourite monoculture of proprietary products and solutions. By supporting Free Software groupware and establishing basic infrastructure founded on Free Software and open standards in your own organisation, you establish an environment of fair competition, nurture a healthy and often necessary technological diversity, and you give your organisation the strategic freedom that would otherwise be denied to you. To have the choice of Free Software in any particular application or field, we need to sustain those giving us that choice and not just say that we would use it “if only it were better” and then pay a proprietary vendor for something nicer or shinier instead. Please keep such things in mind when evaluating solutions for your organisation’s immediate and future needs.